Rummage through your car’s glove box, ignoring the piles of old receipts, the owner’s manual, and maybe a long-forgotten Nirvana CD, and you’ll notice there’s something missing. Something that, seemingly overnight, vanished into history. With the swift development of in-car navigation and then Google in the palm of your hand, physical maps have faded into obsolescence. Artist Matthew Cusick, 47, is instead finding new avenues for exploration in their faded pages. 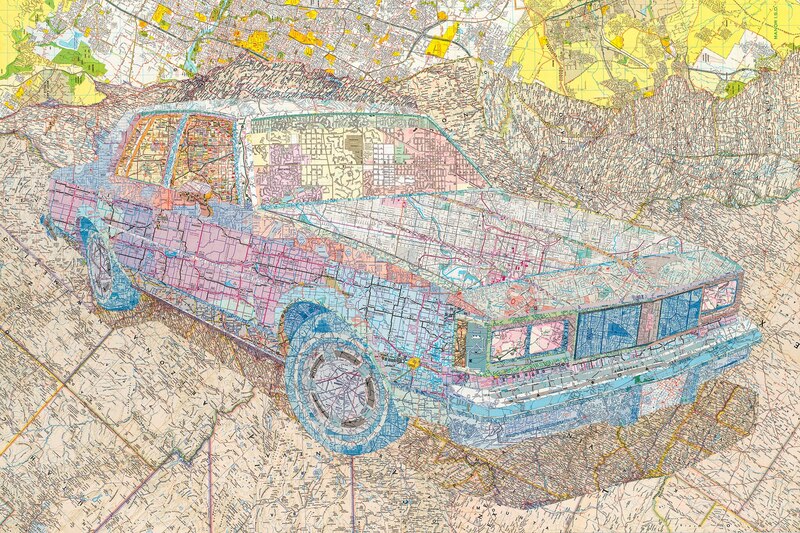 Born in New York City and now living in Dallas, Texas, Cusick’s fascination with history manifests itself in dizzying collages of old cars and somehow-beautiful vistas of highway networks. 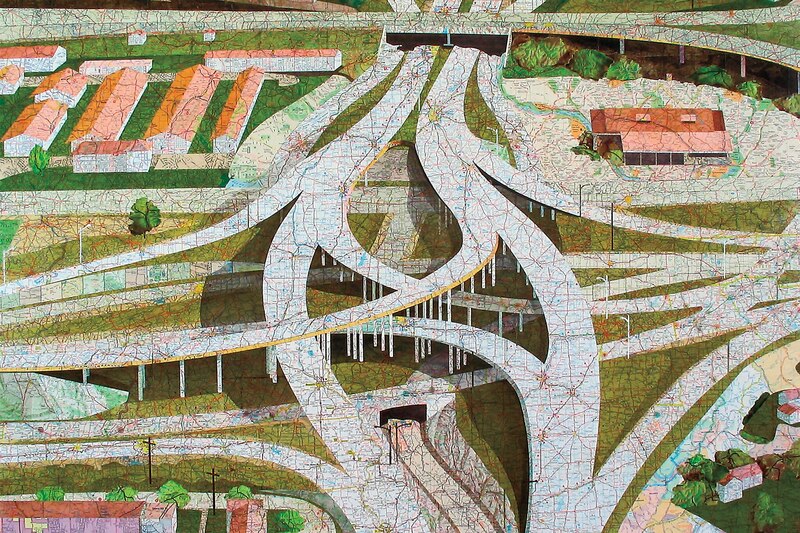 Each one made up of numerous map scraps, sometimes of the same location from various points in time, Cusick’s creations are like looking back at the ebbs and flows of the American road all in one gulp. The vibrant, disparate colors of the various two-dimensional maps, occasionally enhanced with acrylic paint or walnut ink, cohere into a 3D world of decades past. A child of the 1970s and its budding recreational travel culture, Cusick uses clashing color as a loving reminder of the maps he used to find at gas stations all over the country. 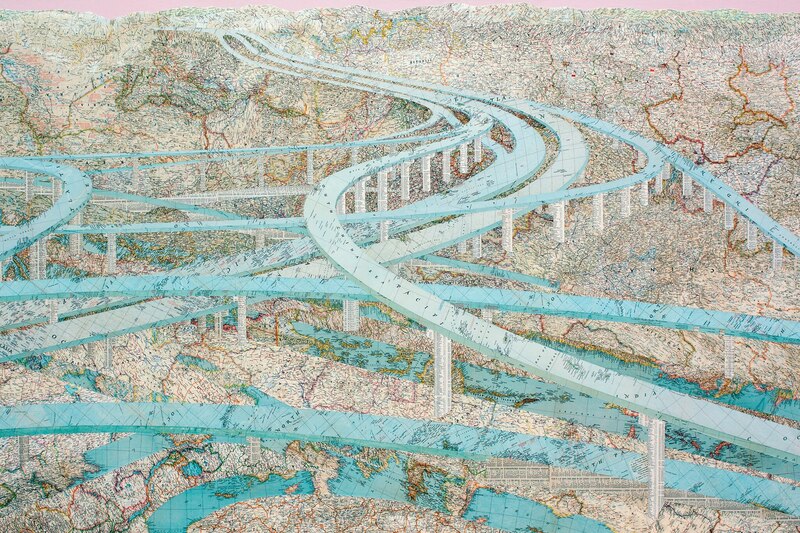 So where does a person get the thousands of maps needed to make such intricate collages? The first ones he used came from National Geographic issues discovered in his grandmother’s attic when this project began in 2002. Now that many libraries have gone completely digital, donations from places such as the University of Texas have turned into treasure troves of material for Cusick, and there are now even declassified military maps to go along with the growing pile of maps sent by friends and fans. There’s something captivating about Cusick’s meticulous assembly, a fascination in seeing the permanent made plastic. It’s all the nostalgic revelry of Americana without any of the camp. Entranced by the speed, danger, and thrill associated with cars he saw in Hollywood movies, one of his other works is a video collage of more than 300 car chases from classics such as “Vanishing Point” and “Shaft.” The project has gone through more than five editions and is still in progress, a reflection of Cusick’s view of the past and present as concepts in constant motion.